The headline writers at the Washington Post's Express magazine either know exactly what they're doing or may well have suffered a whole omelette on their faces recently. I have to own up to a degree of naivety with regard to the headline as I hadn't come across this particular meaning of the word taint before. I must lead a very parochial life and the significance was lost on me until I looked it up. So thank you, Urban Dictionary, for providing some very funny definitions including the least rude of my favourites "tain't one thing nor the other". 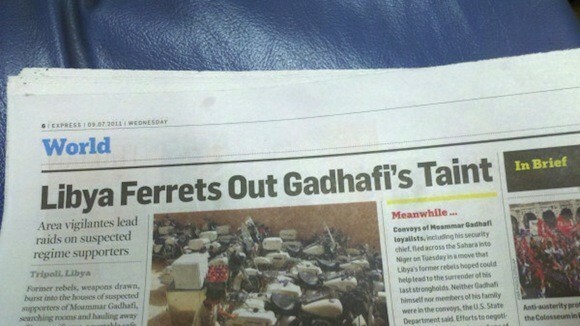 Libya Ferrets Out Gadhafi's Taint. The thing is, what did the headline writer mean to say? I'm bemused. Were they trying to say 'tent'? Seriously, I just can't imagine what they were getting at. It's a good example of a bad headline which is what made me think that the writers knew exactly what they were doing and set out deliberately to create a contrived double entendre. It's as though the headline had been written previously and was saved until a suitable story could be assigned to it. Superficially, I think the writers are suggesting that Gaddafi's supporters are tainted, or contaminated, with the culture of his regime.